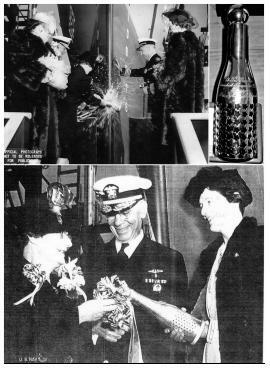 After a U. S. Navy ship is launched, the bottle was often placed in a box and given to the sponsor as a souvenir.... a broken champagne bottle, housed in a sterling silver decorative covering, with the name, date, sponsor, and launching place. Usually the bottle was wrapped in RW&B ribbons. The ribbons and broken bottle is what you normally see in these boxes. If a bottle is inside the silver outer case it is a replacement for the original launching bottle, but the dent from the original launching activity may be visible on the outer case. 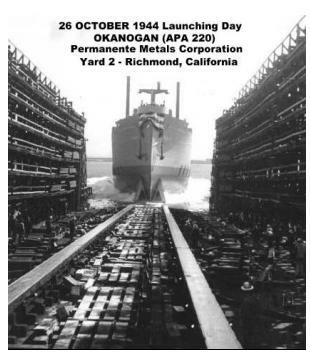 When OKANOGAN was launched 26 Oct 1944, the Navy assigned a sponsor, Mrs. E. J. Husted to smash a champagne bottle against the ship’s bow. A brief moment in time, a blast of the bubbly, and some broken glass....a cheer, and it’s history. But, not so fast! Colin Carney got a phone call from a Mr. Eric Behling asking about an item he and his wife found in an antique shop in Bisbee, AZ. (Miners & Merchants Antique Center - "Floyd’s Back Corner") Eric sent Colin two pictures of the artifact, which appeared to be, perhaps, something used when OKANOGAN was christened/launched. Harv Hochhalter has our Launching bottle! The owner in the shop said he picked the bottle at a sale in Tucson, Arizona. For $90.00, Harv bought the bottle and got the owner to pack and mail it to him. 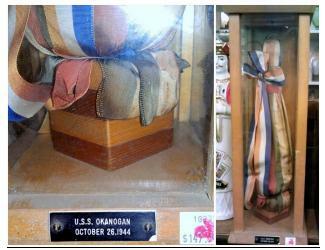 The box has the date October 26, 1944, and included a card printed with "Launching Bottle 533-107." The box needed a bit of repair with a broken hanger and some loose screws. After a little cleaning it will remain "as is". Harv plans to get the bottle and box to Portland and then a decision can be made on what to do with them.